There are a number of issues that we look to prevent in children at Walker Pediatric Dentistry, and among the most common are tooth infections. Because immune systems in children have not fully developed yet, children are at a higher risk than adults of a basic tooth infection. Like with many elements of pediatric dentistry, you as a parent can be a big assist here for us. The sooner a tooth infection is caught, the easier it can be to remove – and prevent from happening again. Here are some basic telltale signs that your child might have an infected tooth. Infected teeth will commonly turn a darker color than the surrounding teeth. For parents who still take part in brushing their child’s teeth, this is often the easiest way to spot infection early. Another visible sign is swelling in the gums near the tooth, which will show up as red or swollen – generally directly around the tooth that’s infected. The neck and the jaw may begin swelling if the infection is allowed to spread, and these are common telltale signs for parents who aren’t actively participating in brushing with children. Remember that kids probably won’t be aware this swelling is taking place, so you have to be diligent. Pain and major sensitivity in the tooth area are often the first noticeable symptoms of an infected tooth. For children who don’t know well enough to speak up about this, you may also notice pus in the area or significant chewing trouble in your child. Know that even if pain goes away briefly, this could just be a signal that the tooth pulp has died – this does not mean the infection is gone. You may notice your child struggling to eat consistently, or complaining of feelings like nausea or fever. Weight loss can become a noticeable issue in some cases. Kids may complain of a bad taste in their mouth, or you may notice significantly bad breath on multiple occasions. Make sure this isn’t just a one-time issue, but if bad breath shows up repeatedly with any of the other symptoms described, that’s a pretty clear sign. 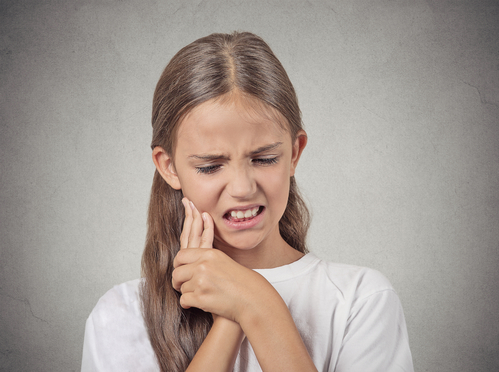 To learn more about the telltale signs of tooth infection, or to find out about any of our other family dentist services, contact us at Walker Pediatric Dentistry today.